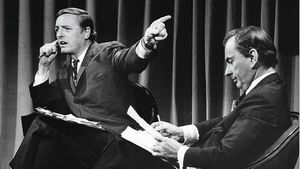 “Best of Enemies”: In 1968 liberal pundit and novelist Gore Vidal and conservative commentator/publisher William F. Buckley Jr. were at the peak of their powers. Both were outspoken, egotistical and strongly opinionated — and the likelihood that the two would meet on the same stage was next to impossible. Until last-place ABC News came along. The 1968 presidential campaign was a minefield, pitting Richard M. Nixon and his Vietnam war hawks against Hubert Humphrey and his peaceniks (who can forget the horror of the Chicago Convention and riots). Looking to boost their ratings, ABC hired the two towering public intellectuals to debate each other during the Democratic and Republican national conventions — setting off explosions that have ricocheted 50 years to the present. News commentary was changed forever: the even-keeled discussions of the past gave way to explosive exchanges that devolved into vitriolic name-calling as Vidal and Buckley — who believed each other’s political ideologies were dangerous for America — pummeled out policy and personal insults. Ratings for ABC News skyrocketed, setting the stage for future political commentary culminating in the 21st century’s ascension of the hyperbole of Fox News and MSNBC. This riveting documentary takes a look at the rivalry between the two, focusing in on the unscripted debates. A must for students of politics and the media. From Magnolia Home Entertainment. Notorious German serial killer Fritz Haarmann — aka the Butcher of Hanover and the Vampire of Hanover — was responsible for the murders of two dozen boys and young men between World War I and II. His case would partly inspire Fritz Lang’s “M” as well as this forgotten gem from 1973. “Tenderness of the Wolves” treats the viewer to a few weeks in the company of a killer. Baby-faced and shaven-headed, Haarmann is a fascinating, repulsive figure. Using his status as a police informant to procure his victims, he sexually assaulted, murdered, mutilated and dismembered a minimum of 24 boys and young men between 1918 and 1924 in Hanover, Germany — selling the flesh of some of his victims on the black market as food. This is truly a gruesome, uncomfortable, disturbing and harrowing film. But, like the proverbial witness to a car accident, you can’t turn your face away from the fascinating proceedings. The saving grace: Haarmann was caught and executed in 1925. 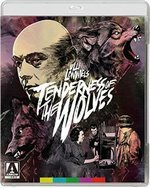 Produced by Rainer Werner Fassbinder (who also supplies a shifty cameo), “Tenderness of the Wolves” provided two of his regular actors with a means of expanding their careers. Ulli Lommel — later responsible for the infamous video nasty “The Boogeyman” — made his directorial debut, while Kurt Raab wrote the screenplay as well as delivering an astonishing performance as Haarmann. In a new high definition digital transfer prepared by the Rainer Werner Fassbinder Foundation with uncompressed Mono 1.0 PCM Audio; in a Blu-ray/DVD Combo from Arrow Video/MVD Entertainment. With “Crumbs” (2015 — Spanish-Ethiopean-Finnish), Spanish director Miguel Llanso made his feature-length debut with this festival favorite, an award-winner at 2015’s Los Angeles Film Festival and Fantasia International Film Festival. Set against the background of spectacular, wild and desolate Ethiopian landscapes, this post-apocalyptic, surrealist science-fiction romance revolves around a strange-looking scrap collector, Gagano (played by the charismatic Daniel Tadesse), collecting the priceless crumbs of decayed civilization — Teenage Mutant Ninja amulets, toy ray guns and Superman costumes — including the most valuable: merchandise from Michael Jackson and Michael Jordan. Hovering high in the sky is a spaceship — in the shape of a raised arm — that seems to be starting up, sending the diminutive Gagano on a quest to the “old city” to find out if he and his true love Birdy (Selam Tesfaye) can land seats on the ship. Gagano and Birdy live in a deserted bowling alley; one of the bowling machines offers a view to the “old city” where Santa Claus holds court. Gagano treks through train yards and deserted landscapes inhabited by a seer-like pawn broker, a witch, a Nazi, and assorted odd-ball human detritus. This surreal and unforgettable film is kind of what would happen if David Lynch met Luis Bunuel in Ousmane Sembene’s Africa. Extras include two weird short films by Llanso: “Night in the Wild Garden” and “Chigger Ale.” From IndiePix Films. 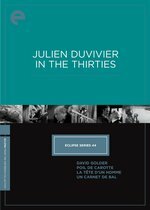 You may not know the name Julien Duvivier, but after you’ve seen the striking films in Criterion’s “Eclipse Series 44: Julien Duvivier in the Thirties,” you’re unlikely to forget it. Though he is often overlooked today, he made some of the most influential films of the 1930s. The titles range from mystery to melodrama, their settings from night-cloaked cities to rural villages, and each one is a movie master class. Remembered primarily for directing the classic crime drama “Pepe le moko,” Duvivier was one of the finest filmmakers working in France in the 1930s. He made the transition from silents to talkies with ease, thanks to a formidable innate understanding of the cinematic medium, and he married his expressive camera work to a strikingly inventive use of sound with a singular dexterity. His deeply shadowed, fatalistic early sound films “David Golder” (1930) and “La tete d’un homme” (1933) anticipate the poetic realist style that would come to define the decade in French cinema, while the small-town family drama “Poil de Carotte” (1932) and the swooning tale of love and illusion “Un carnet de bal” (1937) showcase his stunning versatility. These four films — all featuring the great stage turned screen actor Harry Baur — are collected here, each evidence of an immense and often overlooked cinematic talent.